Display and protect information behind clear, shatterproof acrylic locking doors. Information is easy to update and change. Thick self-healing natural cork holds push pins tightly and provides an excellent, resilient tacking surface. Each board has a dense fiberboard backing, sealed to reduce moisture absorption and resist warping. 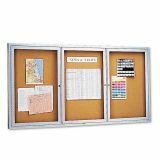 Quartet Enclosed Bulletin Board, Natural Cork/Fiberboard, 72 x 36, Silver Aluminum Frame - Enclosed, cork bulletin board delivers quality performance when communication is needed in any indoor environment. Three locking, shatterproof acrylic doors allow posting, protecting and easily updating important messages. Highly durable, enclosed natural-cork bulletin board is backed by high-density fiberboard. Self-healing surface and high-density backing deliver maximum pin-holding power, ensuring documents stay securely posted. Satin finish, anodized aluminum frame with full-length hinges complements any interior. 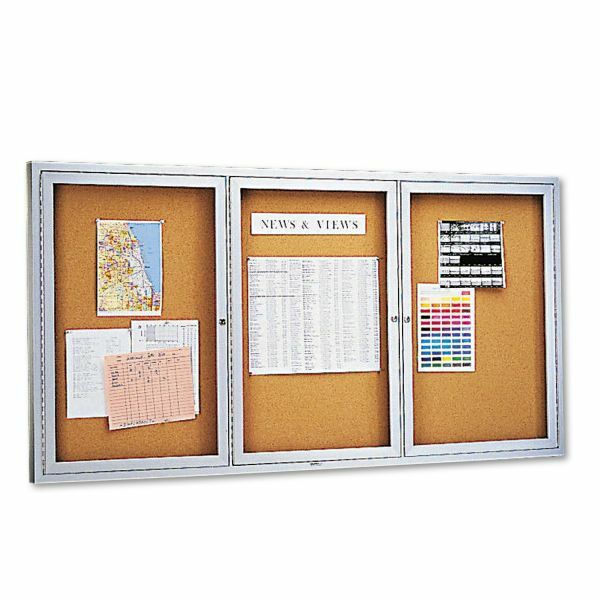 Indoor bulletin board includes one key per lock. Hanging devices are factory-installed. Specially designed, security lock system secures board to wall.